Customers at Berkshire Palate enjoy sliders – called “Little Buns” – and a variety of hot and cold snacks. Courtesy of iBerkshires.com. Williamstown’s Colonial Plaza – perhaps better known to students at the College as “near Rite Aid” – has seen several restaurant openings in the past months. 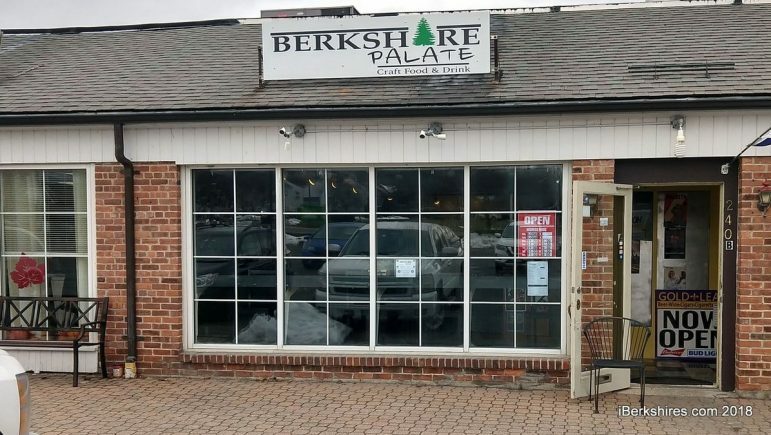 One of these is Berkshire Palate, a new venture owned by three brothers, Zach, Aaron and Nolan Brassard, and their father, Paul Brassard. Zach, a chef by trade, oversees the menu; Aaron, Nolan and Paul all work in the restaurant as well. One wintry evening, famished from the brutal academic exertion of Winter Study, I paid Berkshire Palate a visit to see what the new place was all about. The restaurant sits in the Colonial Plaza mall among several other storefronts. The interior has, on one side, a chalkboard wall prominently featuring the restaurant’s locally sourced ingredients and menu, and on the other, an open view of the kitchen. The menu offers a variety of hot and cold “snacks” as appetizers, such as wings or a roasted vegetable salad, as well as more traditional entrees, but the focal points of the menu are the sliders – “Little Buns,” as they are termed. For my meal, I ordered a tasting flight of three sliders, served with a side of fries for $14. I started with the “North Carolina BBQ,” an appropriately vinegary take on that style, served with an excellent purple cabbage slaw for some textural contrast. Continuing in the barbecue direction, I also tried the “Brisket BBQ” slider, which was similarly delicious. With the advent of new barbecue places in the local area (such as A-OK in North Adams), Berkshire Palate’s offerings are a welcome addition to that roster. I finished off my trio of sliders with “The Hangover,” a take on a breakfast sandwich and my favorite of the bunch. The house-made sausage was excellently paired with an egg, but what sealed the deal was the locally sourced maple syrup glaze. It provided a sweet contrast to the savory meatiness of the sandwich and rounded out the slider well. The trio came with fries, which complemented the sliders nicely. Among my dining companions – who, full disclosure, were my parents – we also sampled the “Cuban” and “House Cured Salmon” sliders, along with the braised short rib dish for $20. The Cuban slider was another highlight of the meal, expertly combining the flavors of a Cuban sandwich – pork, ham, swiss, pickles and mustard – in slider form. The salmon and its accompaniments were good, though with our being from New York City, the bagel that the slider was served on underwhelmed. The braised short ribs, served atop mashed potatoes with blue cheese and pickled onions on top, were solidly prepared, but the restaurant’s strength is definitely the sliders menu. For dessert, I had the affogato, a toothsome twist on the traditional Italian preparation with espresso poured over salted caramel ice cream and topped with a caramel drizzle, which, for coffee aficionados, makes for a terrific nightcap. All told, Berkshire Palate is an excellent addition to the array of restaurants in Williamstown. Their slider flights and fries are a decently portioned meal for a dinner and fall within the range of what one might pay for dinner on Spring Street or elsewhere in Williamstown. My palate definitely recommends Berkshire Palate. Berkshire Palate is located at 240 Main St. in Williamstown, in the Colonial Plaza shopping center. It is open for lunch and dinner from 11:30 a.m. to 9 p.m. Wednesday through Sunday, with extended hours until 9:30 p.m. on Friday and Saturday.